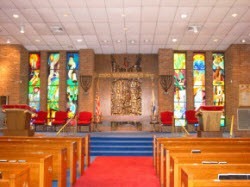 Congregation B’nai Jeshurun, a member of the United Synagogue of Conservative Judaism, was the first Jewish congregation on Staten Island. We are an inclusive and egalitarian congregation that welcomes people from the entire community. We offer Hebrew School classes, monthly family services, and special programs throughout the year. Our Hebrew School is flourishing with classes on Thursdays and Sundays. Bar/Bat Mitzvah lessons are available as well. Our teens are tremendously active and influential in our community, they have developed their own Hebrew High School program that focuses heavily on community service. Come join us for services in our beautiful sanctuary or come to one our many community wide programs. We welcome you and your family to our CBJ family. Shabbat Junior Congregation – 2019! Congregation B nai Jeshurun of Staten Island (exactly as it is spelled here with a space between the “B” and “nai”. Half of 1% is donated to CBJ by Amazon. The cost to you is nothing, we will benefit from your purchase, and you don’t have to do a thing! April 20 Saturday morning - Services 9:15 a.m.
April 21 Sunday morning - Services 9:15 a.m.
April 26 Friday morning -Services 9:15 a.m.